Paper and Packaging – The Answer Is In The Box! 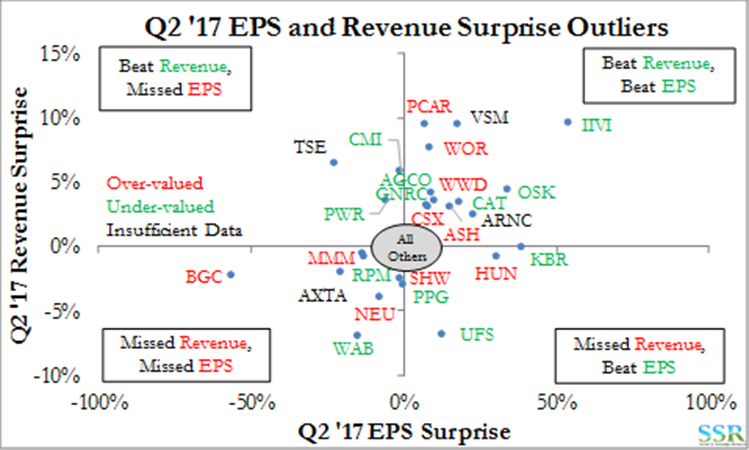 In the chart below we show only the outliers for Q2 in terms of revenue and earnings misses and beats. There is a large group in the circle in the middle, covering each quadrant, but we wanted to focus on the real outliers. 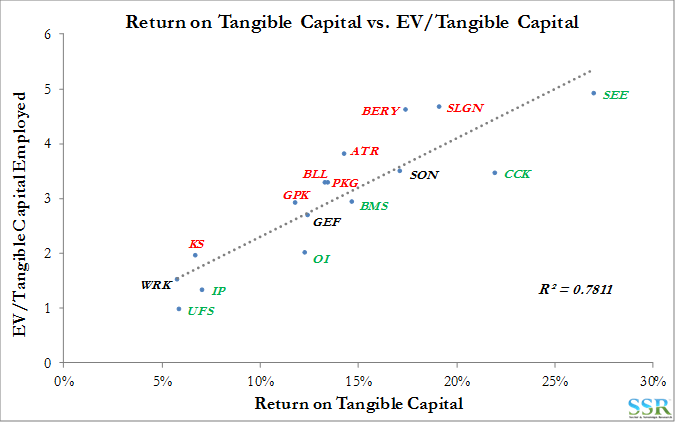 In the chart, any company in Red is expensive on our normalized framework, any company in Green is cheap and anyone in Black does not have enough history to generate the analysis. 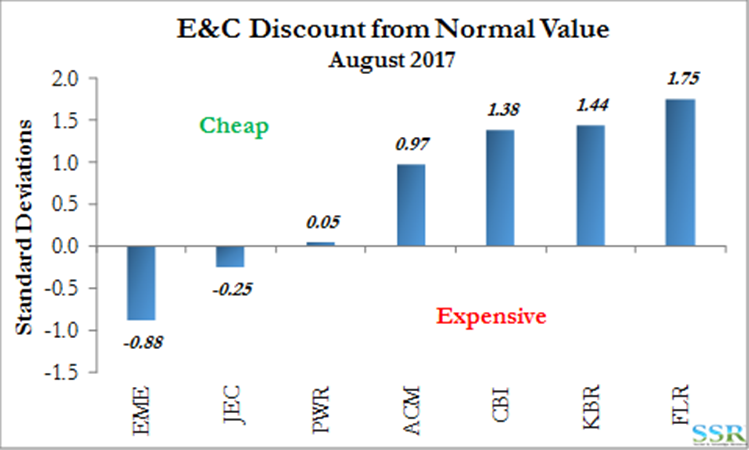 We also include a ROTC based analysis in the second chart which is a measure of current valuation against current capital. As most readers will know, our goal at SSR is to fish in a very large pool and come up with a handful of ideas. This type of analysis gives us themes, paths etc. to explore further in the hope of finding what we think are very high conviction ideas. While we have not done sufficient work to put these names on high conviction lists – IIVI and OSK look interesting on the long side, BGC on the short side. 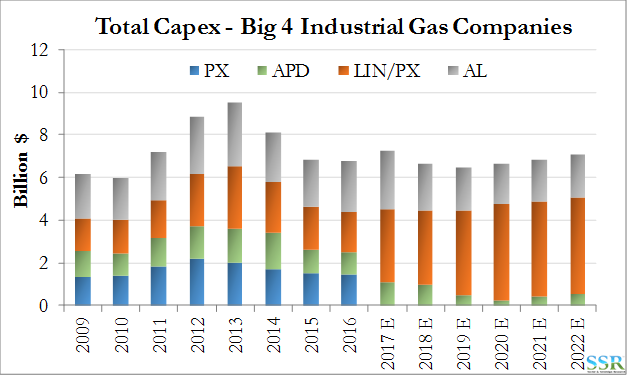 We have completed a week of detailed work on the industrial gas industry and have built an approximate industry model to illustrate what we estimate will be the most important longer-term impact of the LIN/PX deal (should it go through). This is the opportunity to deploy capital in traditional industrial gas “take or pay” projects. We believe that PX and Linde’s design, cost and execution skills should allow the company to grow share, a move that we also show would adversely impact APD more than Air Liquide – as illustrated in the first chart. While we do not expect the LIN/PX deal to close until the end of 2018 we show pro-forma combined capex for 2017 and 2018. We do not expect the new Linde to take share until 2019 and the share gain accelerates in 2020. The new Linde could have the cost base and the cash/borrowing capacity to take all of the new business available to the industry – capex to sales would not rise above levels common in the sector in the late 1990s. We have assumed that the company only takes business which is accretive to returns. Air Liquide will likely lose some share but has investment programs in the US and other opportunities which should allow capex to remain at acceptable levels given the need that the company has to pay down debt following the Airgas acquisition. Air Products could lose out disproportionately as shown above. The net effect is accelerating earnings at the new Linde that surpass consensus expectations significantly by 2020 and accelerate thereafter. Air Liquide should do better than expectations also, but only if the company focuses on its relatively bloated cost base. Air Products, by contrast, should miss already low earnings forecasts. 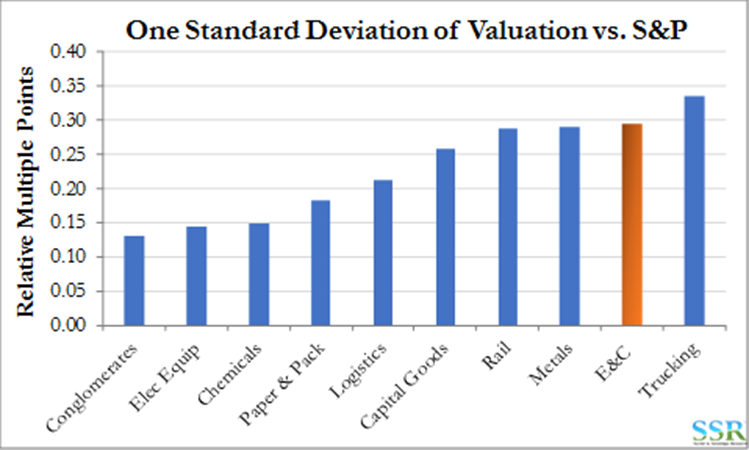 Against this backdrop, valuation is upside down – see chart. 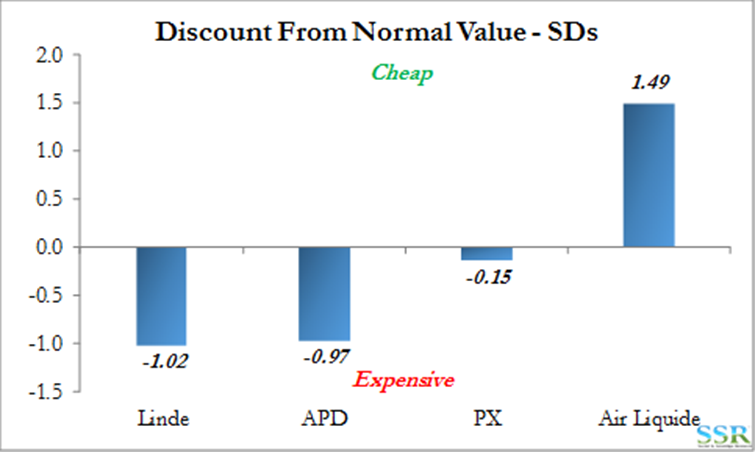 Air Products is the most expensive company with the least promising future. The new Linde could more than double in value from today to 2022. Part of the problem is an industry wide shortage of both skilled engineers and skilled craftsmen. This combined with placing too much faith in overseas sub-contractors (almost out of necessity), results in earnings misses like we saw this week from CBI. The stock has dropped from $30 to $12 since May. CBI are EPC managers of several large projects in the Gulf Coast as well as elsewhere in the US and in the rest of the world – it is not the US petrochemical projects that are causing the current write downs – it is LNG projects that are mostly to blame – for now. 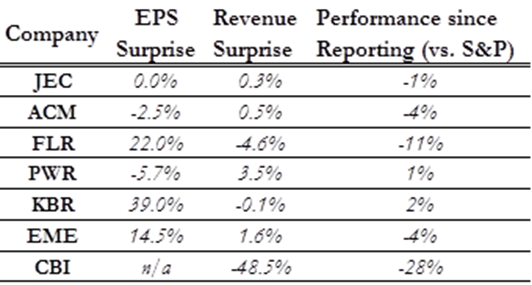 Illustrating the modeling issues are results for Q2, with some significant misses as well as some earnings beats – table. 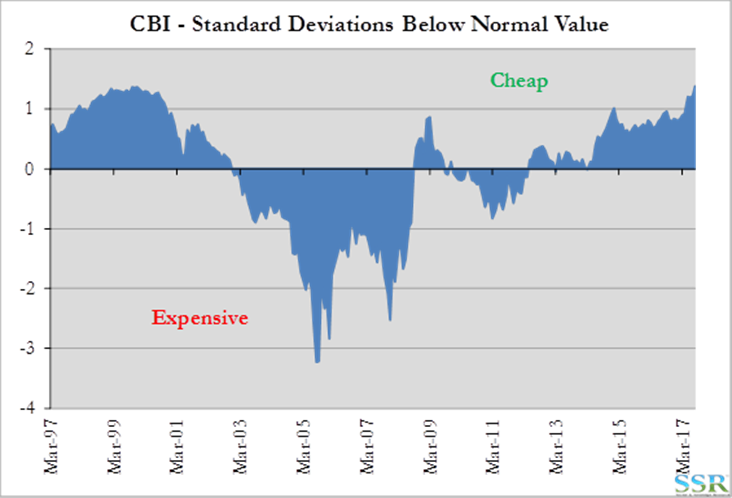 The struggles that the sector is having is reflected in the valuation discounts in the group – chart – and the volatility in valuation is best shown with CBI as an example – second chart. 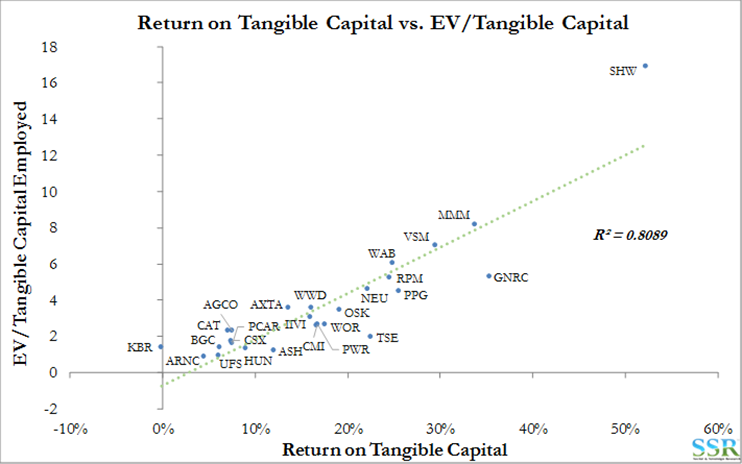 As a sector, E&C has more valuation volatility – i.e. more risk – than any other sector in Industrials and Materials except Trucking. Note that CBI looked inexpensive before this week’s blow-up – valuation is not a great guide to investment attractiveness here. Despite average outperformance from the beginning of the year the paper and packaging space remains attractive and in particular most of the containerboard and free sheet names. 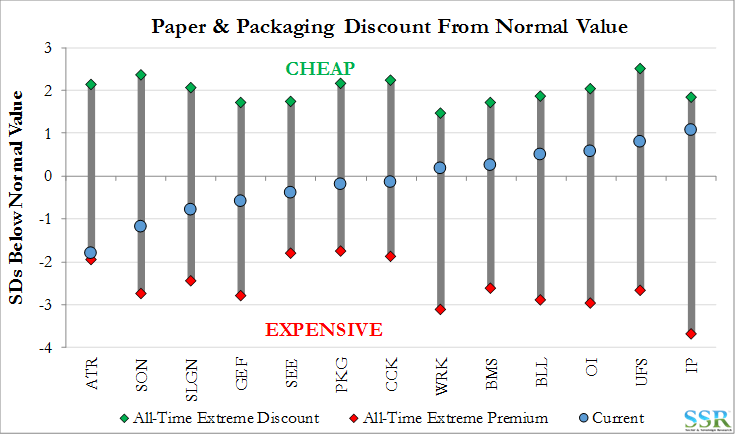 Our longtime favorite in the space, PKG, has now hit fair value and while we still see upside, especially if pricing momentum continues in containerboard, or if there is a trade shift in free sheet, both IP and WRK look much more interesting today. See charts and recent research. On the flip side, if we believe our own work on ethylene (see recent research), the plastics packaging companies could be in for a bit of a rollercoaster ride for the next 12 months as we expect ethylene and its feedstocks to be volatile through the period of new capacity start-up. Most plastics packaging companies buy their polyethylene on a cost based formula either tied to ethylene or to ethylene costs. At the other end of the business their customers will likely not take that level of volatility in pricing. The net result is likely to be earnings volatility for the plastics packaging companies. ATR looks like the most expensive, and therefore most vulnerable to this risk.